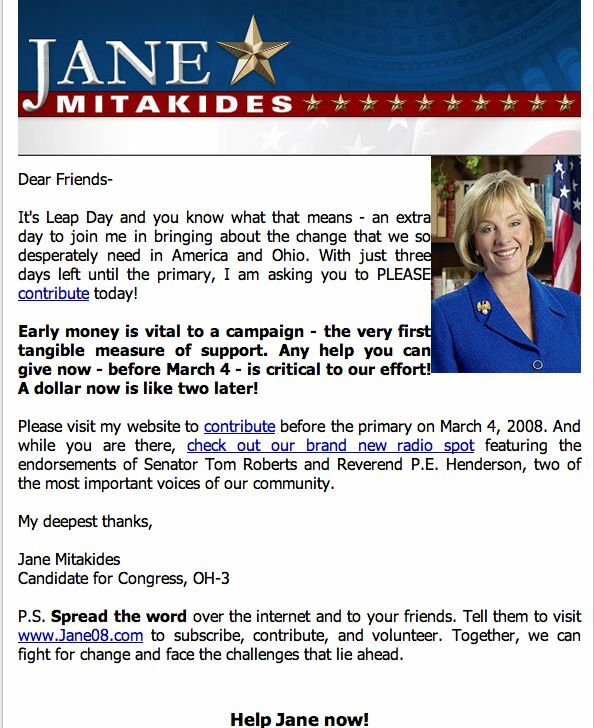 Just got an e-mail from Jane Mitakides. Apparently $5K from a DC PAC and an average donation of $995 is not enough, she still needs more. $50,000 of her own money needs to be backed up with your cash (it’s only a loan). It’s Leap Day and you know what that means – an extra day to join me in bringing about the change that we so desperately need in America and Ohio. With just three days left until the primary, I am asking you to PLEASE contribute today! Early money is vital to a campaign – the very first tangible measure of support. Any help you can give now – before March 4 – is critical to our effort! A dollar now is like two later! Please visit my website to contribute before the primary on March 4, 2008. And while you are there, check out our brand new radio spot featuring the endorsements of Senator Tom Roberts and Reverend P.E. Henderson, two of the most important voices of our community. P.S. Spread the word over the internet and to your friends. Tell them to visit www.Jane08.com to subscribe, contribute, and volunteer. Together, we can fight for change and face the challenges that lie ahead. It sure is nice of Tom Roberts to support Jane, a Hillary Clinton supporter, even though he’s strongly backing Barack Obama. Makes you wonder how much money he wants from the bank of Mitakides for his own campaigns. If this kind of no message message makes you want to hurl- consider coming to our “Guaranteed Winner Party” on Tuesday and support a local charity instead of a campaign that may be toast on Wednesday (mine or hers).